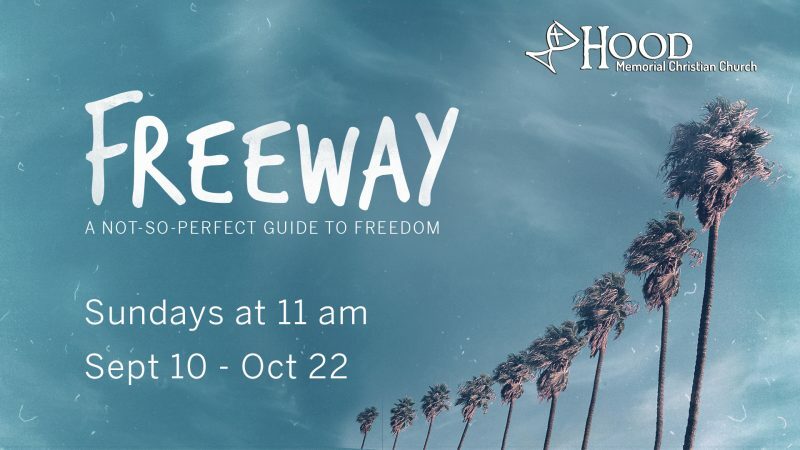 Freeway – a not so perfect guide to freedom…just 12 days away! I am incredibly excited for our family of faith at Hood MCC to experience this amazing journey together! Freeway is a spiritual journey for those who have realized they have spent too much of their life believing something about themselves or others or God that turns out to be not the least bit true. It’s for those who have wrestled with regrets or have been labeled or stigmatized or called something that, if we are honest, kinda hurt. Freeway is for those who have found forgiveness to be almost impossible, for those who have been left hurt or confused or disillusioned by Christianity or the church. I can’t say for certain that Freeway is for everyone, but I have a sneaking suspicion……it might be just for you. On Sunday Sept 10, we will begin looking at Freedom through the idea of Invitation. Then, over the next 6 weeks, we will explore our life journeys through these themes: Awareness, Discovery, Ownership, Forgiveness, Acceptance, Freedom. This is no simple, surface bible study that reaches a mile wide but only an inch deep. We will dig deep into our lives, our struggles, our hopes and dreams, our joy and our pain as we search together for the freedom and salvation that God is offering to each of us right now! I pray that you will join one of these Small Groups as we embark upon a journey of growth and freedom together. This is a seven week commitment and we are asking you to make this commitment in your own spiritual journey with our church family.If you have any questions, please reach out by replying to this email or calling Pastor Jason (704-391-8529) or Pastor Joanie (540-529-2712). Again, I cannot wait! And I hope you are getting excited as well. In fact, I hope you will invite a friend, a co-worker, a family member, even someone you meet at the grocery store this week to join us at Hood and be a part of our family of faith as we seek to serve Christ by mutually supporting one another and embodying God’s grace and love for all.